500 point games also happens to be how I got my start into Bolt Action. I bought a single 25 man box of British Infantry and pointed that out as a 500 point army with two Artillery Forward Observers. In today’s post, we take a quick look at a 600 point game that I played at Forbes Hobbies quite some time ago. 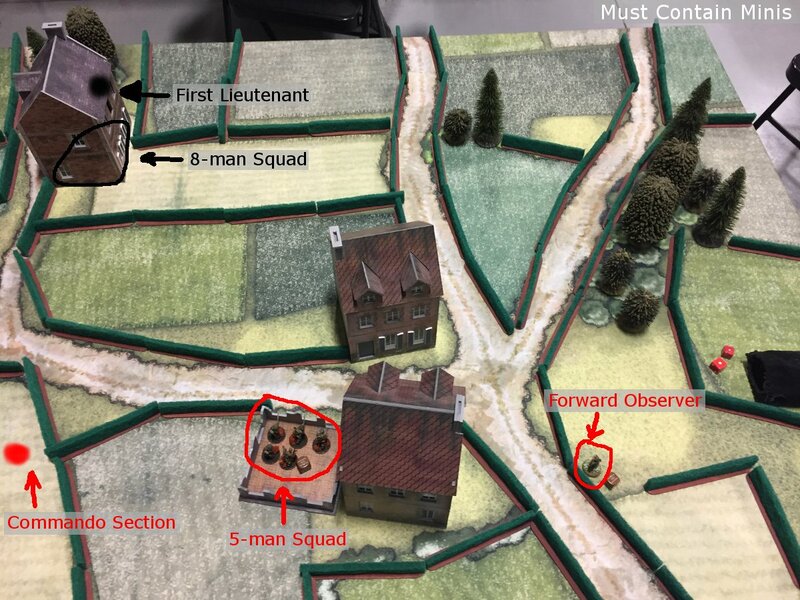 Before going further, I do want to acknowledge that all of the images in this post are from Must Contain Minis and this post is a Coles Notes’ version of a Battle Report from that website. I brought 600 points of British to the table. Above is my 600 point army of British. 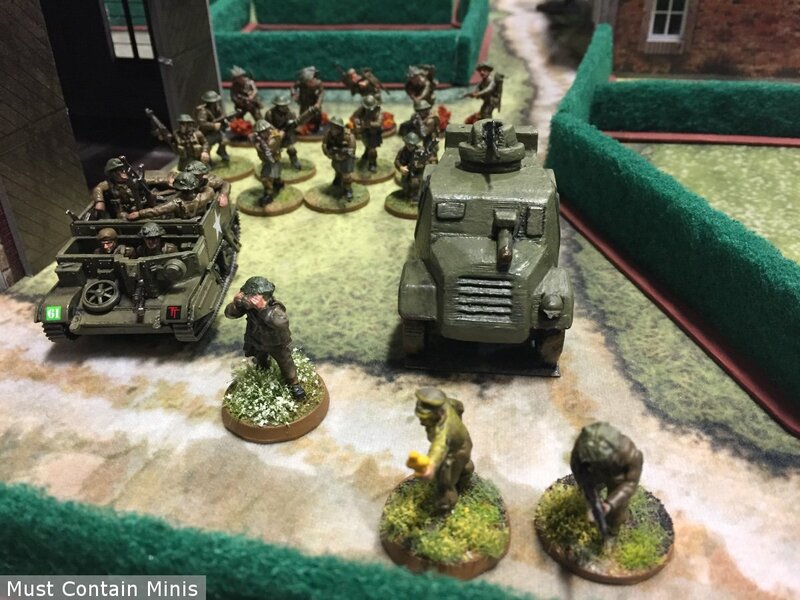 My force contained 2 five-man squads (each with 3 SMGs), an eight-man Commando squad (armed with one Bren gun, Anti-tank grenades and two SMGs), A Bren Carrier (as a transport), An Otter Armoured Car, a Forward Observer and a First Lieutenant with a helper. One of the five-men squads is not pictured here because they are “mounted” in the Bren Carrier. These men started mounted in the Universal Carrier. If you know your Bolt Action armies, you may notice that I don’t have a lot to contend with armour. I figured it wasn’t too likely that I would be facing any heavy tanks. My opponent brought to the table one Panzer IV, two 8 man squads (each with an LMG) and a First Lieutenant with one helper. Above is the German Army. I don’t have much that can touch that tank. I am in trouble! As an aside, if you encounter a tank and you don’t have the proper assets to address it, all you can really do is ignore or avoid it and hope for the best. I find aggressive play often rewards me better than defending, so my forces will be on the move in this game. This battle is set on an absolutely gorgeous table. The mat is by Cigar Box Battle Mats, the houses are by Plastcraft Games. The mat belongs to me while Forbes Hobbies supplied the rest of the terrain. The battlefield where our story unfolds. We rolled a “meeting engagement” as our battle for the night. As such, both forces had half their armies nominated for the First Wave and the rest for reserves. Reserves come onto the field after the first turn. Being that this is not a full battle, I am just going to go over the highlights of this battle. After the first round, both forces brought on half their forces as pictured below. Above is how the battlefield looked after the end of the first round. The Brits are labelled in red while the Germans are in black. 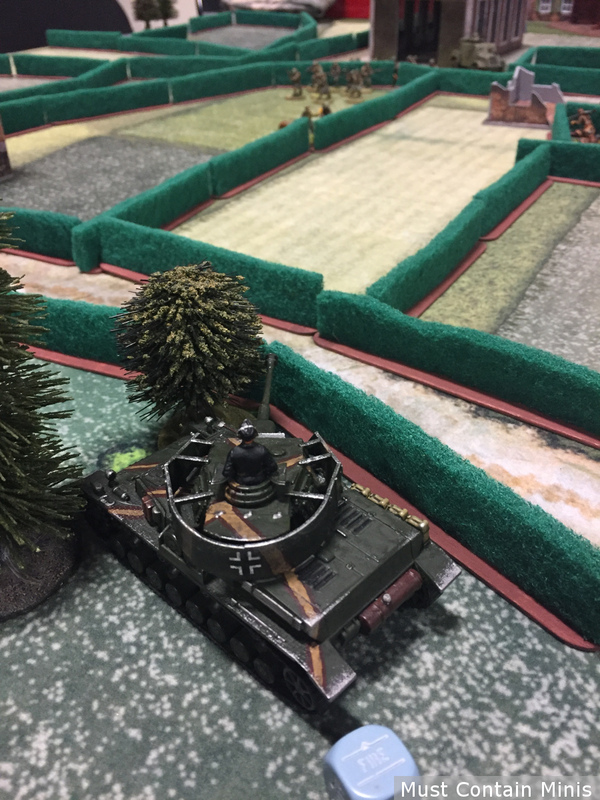 By the end of the second turn, the Germans brought on their tank. I hid most of my units from its line of site. Neither side took a casualty yet. For the third turn, I decided to take a different approach. Being that I had more units, I flooded the field with too many targets for his tank to focus on. So I decided to flood the field with targets for the tank. The only thing safe was my Otter hiding behind that house and the group of men near it in the ruins. I also ended Turn 3 by calling in an artillery barrage on the tank. The bombardment came in and I was lucky enough to immobilize the tank. With the tank stuck, I ran my troops down the far side of the battlefield to dominate the left side of the board. I rushed my troops across the field scaring the German forces right out of the house that they occupied. Here four of my units charge in on two smaller units of my opponent. Although the tank was immobilized, it still had line of site to most of the battlefield. Lucky for me, my opponent was having issues hitting. I am a fair distance from the immobilized tank, but I am not safe from its gun. Good thing his aim is bad! 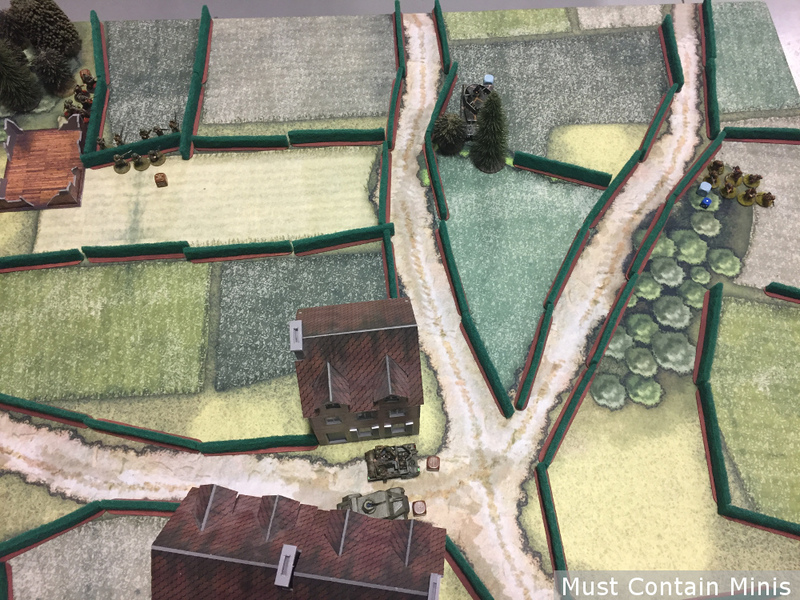 By the end of Turn 6, the Germans were winning by one kill (but you have to win by two or more kills to achieve victory). In fact, there has been just been one kill so far this whole game. 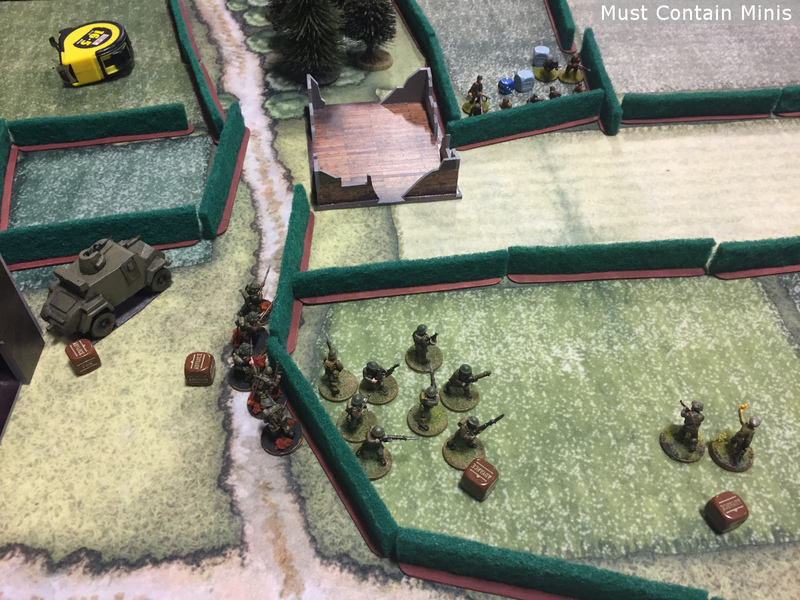 The Brits were close to their first kills, so we rolled to see if there would be a turn seven. There would be. Tuns 7 proceeded but the game would remain a draw. The Brits killed 2 German units and the Germans killed 2 British units. The battlefield at the end of the game looked as above. The Germans had two units left and the Brits took some loses too. The game concluded as a draw. I had a lot of fun playing this game. 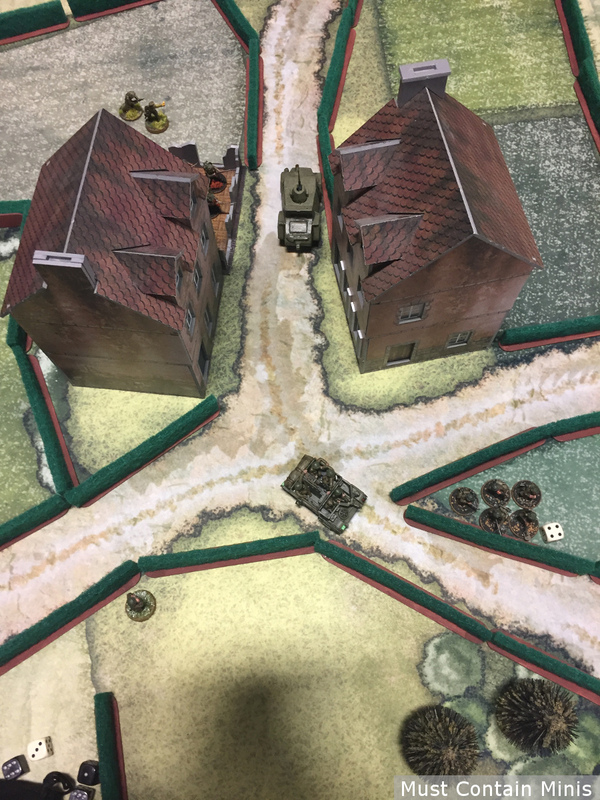 Special thanks goes out to Forbes Hobbies (in Cambridge, Ontario, Canada) for providing us with the space and Terrain to play and to Cigar Box Battle Mats for providing me with the gaming mat that we used. It really helps make the battlefield pop. 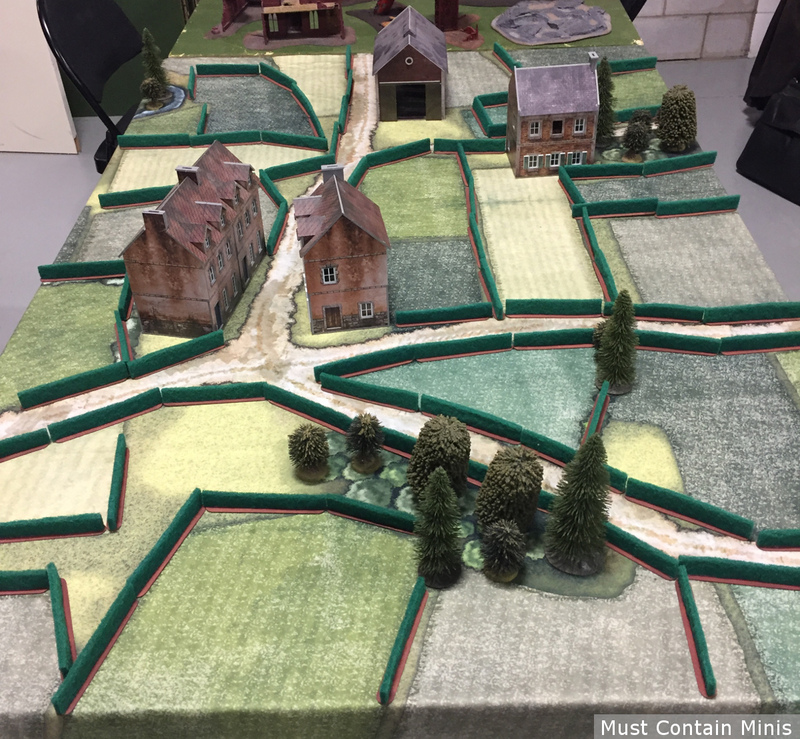 If you haven’t tried a 500 to 600 point Bolt Action game, give it a try sometime. It is a great way to get experience with the system or just a to get in a quick game. If you want to read the full battle report with a turn-by-turn breakdown, come on over and check out the original article that I used to create this one for Bell of Lost Souls.